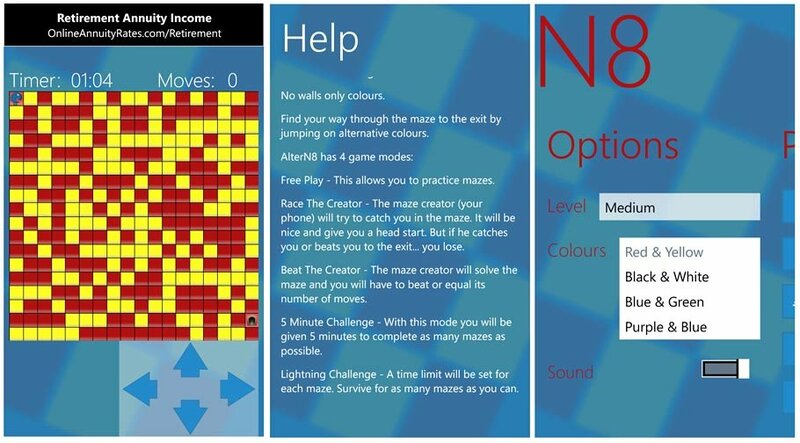 Altern8 is a puzzle game for your Windows Phone that offers you an alternative to mazes with walls. Instead of having your movement restricted by traditional walls, Altern8 restricts your movements through maze puzzles by colored squares. You move through a grid of colored squares, alternating the colored squares you land on, as you seek the exit. Altern8 has five gaming modes, five difficulty levels and four color pairs. Altern8 is a fun, change of pace styled game that is worth a try if you're looking for a game to play while passing the time. Free Play: This game mode is great for learning the game. Score is kept but really doesn't count past your personal stats. Race the Creator: You vs. the computer in a game of chase. You will get a head start and then it's off to the races to see if you can get to the exit before the computer player catches you. Beat the Creator: See if you can be the computer in the number of moves it takes to solve the maze. Five Minute Challenge: Complete as many mazes as possible within five minutes. Lightning Challenge: A race against time in that you have to solve each maze before the clock strikes zero. The maze is a series of colored tiles and a movement pad rests at the bottom of the maze. You can move your player vertical or horizontally. Movement can only be done by moving to alternate colored tiles (e.g.. red to yellow to red to yellow). If you get stuck, you can always retrace your steps but that will increase your total moves. Mazes are challenging and with the multiple game modes, Altern8 won't grow stale too quickly. Altern8 lacks an online leaderboard but I'm not sure it's needed. It would be a nice touch but there's enough gaming options to keep you busy with Altern8 you probably won't miss it. 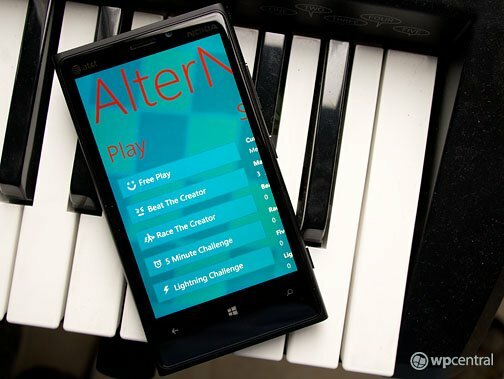 Overall, Altern8 is a fun, challenging puzzle game for your Windows Phone. There is a slight addictive quality to Altern8 and it's a nice game to pass the time with. Altern8 is a free, ad supported game for your Windows Phone that you can find here at the Windows Phone Store.